We’ll touch on a bit of all of that to give you a well-rounded understanding of how to determine CPL and what to do with that information. Before you can worry about how many leads are converting, you have to have leads! Opportunities (potential leads) can be categorized according to the sales funnel, a tool any marketing or sales rep has certainly seen many times. Leads at the top of the funnel are less likely to convert, so you don’t want to focus much of your budget on drawing in those leads. The middle of the funnel are leads in the process of being qualified. Maybe they’ve seen your marketing — becoming marketing-qualified leads, or MQLs — and landed on your site. Or they provided their contact information to access something you’re offering and are now an information-qualified lead, or IQL. These leads are warmer than top-of-the-funnel leads, but they still aren’t highly-qualified leads — that’s where the money is, so that’s where the majority of your focus should ideally be. Sales-ready leads (SRLs) have shown interest in your service or product, offered personal contact information in exchange for collateral and are primed to be passed on to the sales team. Then sales is positioned to take their shot at them with the hope of converting them into a customer! If they don’t make a purchase, keep in contact with them — they’re still a sales-qualified lead (SQL) and are the warmest type of lead in the funnel. These two types of leads (SRLs and SQLs), as well as returning customers, are highly-qualified leads, or HQLs. They are the most likely to convert and thus the most valuable type of lead to any organization. You probably knew most of that already, but a refresher is always helpful before we go deeper. Ideal customer profiles or personas can do a lot of the legwork of segmenting your leads into useful categories. While two single white women in their 30s who work in IT management won’t be identical, you can make informed guesses about their characteristics as a customer. This helps you target them if their demographic is who you hope to sell to. Marketing automation software and customer relationship management software are on the rise in every industry. It’s no wonder why — these systems help businesses improve a range of processes and workflows like sales forecasting, contact management, communication and customer retention. CRMs offer lead scoring options that help users identify engaging content and hone future marketing campaigns. Don’t forget, there’s no shame in reaching out to a lead generation service like SelectHub. In fact, all the big players do it! Lead gen services specialize in attracting highly qualified leads for your specific industry or product. They typically have niche exposure that your company alone may not have the budget or time to nurture. Plus, using a partner’s services doesn’t replace your own marketing efforts — it adds a completely hands-free channel to draw in highly-qualified leads. So now we have a conundrum: that easy formula at the start of the article isn’t quite accurate now. There are a few ways to calculate the actual cost of individual leads from every channel. This is by no means a fail-proof solution for how much you should be paying on average for leads, but it’s a great way to get a baseline. It’s also a great way to gauge how much you should expect to pay based on the quality of a lead — a top-of-the-funnel lead probably shouldn’t cost much more than that average number you calculated, but an SRL primed and ready for a sale may cost closer to your threshold price. This actually works in your favor: the more money you invest in HQLs, the higher your conversion rate, which means that average CPL goes down relationally. If your organization is too multi-tiered or complex for anyone without a math degree to perform some of those calculations I’ve mentioned, never fear. Another helpful way to separate general leads from qualified leads is to segment your costs at each phase. This applies to any cost that goes into getting a lead into your sales funnel and can include marketing campaigns, cold calls, ad costs, etc. If you use a lead generation company like SelectHub, this number will be nicely and tidily organized for you. Otherwise, you’ll need to utilize inbound and content marketing analytics tools to separate the sources your leads came from in order to determine CPL. This step finds the cost of determining whether the lead is likely to convert. Qualifying activities such as creating customer profiles, segmentation and differentiation fall into this category. Once you’ve got a lead qualified, they still have to be sold on your product. The selling phase takes into account sales rep hours, product production and other costs associated with closing a sale. By designating these individual phases, it becomes easier to determine what activities are generating the highest price tag in order to optimize where you’re spending your money. Additionally, you can perform those same calculations on individual phases in order to gauge your average conversion rate at different phases of the sales pipeline. Once you’ve determined your CPLs, you can utilize that information throughout your organization in a variety of ways to drive decision making, budget future marketing campaigns and attract more HQLs. In order to successfully utilize CPL as a KPI, you have to establish benchmarks to compare your data to. If you have been keeping data records for years, this is an easy step: just compare data sets to establish values for a range of variables. This will allow you to determine averages over time — mean CPL during October for the past five years, for example. This data will allow you to pinpoint successful marketing strategies, pain points and trends over time. If you haven’t been consistently collecting data or are a new organization without a history of data to drill down into, don’t panic. You still have plenty of options. First, start collecting consistent data immediately. This is a great business practice regardless of size or industry and will allow you to begin analyzing it within a few months. You can hire a data analyst, train someone within your organization or seek the services of a lead contact database. Or, if you want to make it really easy on yourself, you can effortlessly collect and organize lead information with a CRM system. There are more ways to attract leads than there are days of the year, but here are a few that will drive targeted traffic to your site with the intention of attracting highly-qualified leads. Then you can utilize the formulas mentioned earlier in the article to see the impact of each individual channel. If you see ads claiming they can make you number one on Google overnight, don’t buy it — that’s not how the search engine powerhouse works. But you can become first-page-worthy without relying on shady internet advertisements. Optimizing your website for search engines is a completely attainable process for any business with the time and resources to devote to it. You know who loves being able to get instant answers? Literally everyone. Having instantaneous or speedy contact options on your website can significantly boost your conversion rates with comparatively few resources on your part. Make sure you monitor these communication channels if you have them! Once you’ve got a lead — even if they’ve already purchased — don’t forget about them. According to a Forrester study, companies that focus on lead nurturing were able to capture 50 percent more SRLs (and at a 33 percent lower cost) than other companies. Finding out your cost per qualified lead can be a challenge, but in the long run, it’s more than worth it. 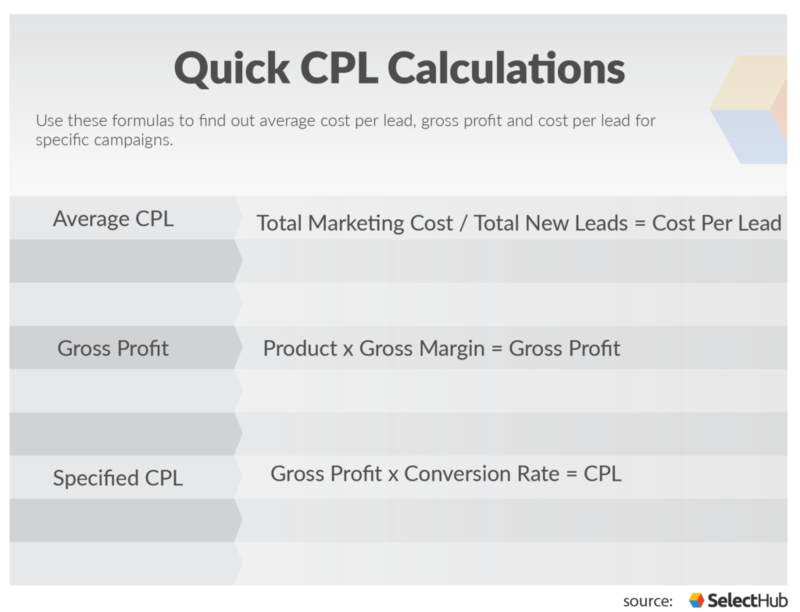 Using a combination of the simple CPL, the allowable cost per sale and the cost per converted lead equations, you should have all the information you need to get a handle on how much you’re paying for individual leads. You’ve also got some tools like SEO optimization and lead generation programs so you can take advantage of every avenue to draw in leads. Take that knowledge and put it to work to optimize your conversions and sell smarter, not harder. Do you still have questions about CPL? Want to know more about our lead generation service? Let us know in the comments!